"This morning, the above home security system was installed in/around my house by Messrs Joey Collins and Ashley Wade. Ashley undertook the majority of the installation under the guidance of Mr Collins. "It's very important to our customers and staff that they feel safe and secure during their visit to our store and the desecrate measures now employed ensure this. This cost efficient update also provides offsite monitoring whereby approved viewing of the store can take place 24 hours a day. This FOC added feature is invaluable for security monitoring and the efficient running of the business." "The nature of our business means it is imperative that any service provider can give immediate back-up on 24hr basis with a quick service turnaround. 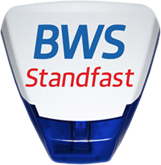 In this respect, the service provided by BWS has always been first class, and I'm sure our partnership will continue for many future years. We would recommend this firm highly." - Mr K Randall, Operations Manager, The Mall Galleries Shopping Centre.